Durable, warm and comfortable fleece top boots for your horse. These bell boots are made with a fleece top for added comfort and protection for sensitive pasterns. 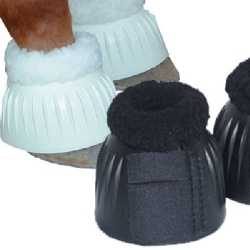 These durable Fleece top Bell Boots are great for horses who chafe easily with regular rubber bell boots. These Bell Boots are also great for shipping. Soft fleece around the top of the bell with double touch tape closure.